Do you know that sometimes you need to get dirty to get clean ? The skincare junkie in me wanted a new face mask and I just got my very first product from Antipodes. I've heard so many good things about this skincare brand from New Zealand and I was simply dyeing to try their products. I thought it would be a great idea to start with this Holo Skin Brightening Facial Mud Mask enriched with Vinanza Grape & Kiwi, Avocado oil, extract of peony flower and of course volcanic and regenerative mud from New Zealand. Antipodes has pure, safe and natural formulations created from unpolluted New Zealand nature. Whatever you add to your skin is ingested, and for the power of beautiful skin and a healthy body, Antipodes is using only the most premium ingredients. This Antipodes mud mask delivers a high performance detox for a luminous complexion. The volcanic mud is rich in sulfur, calcium, silicon and sodium and it binds to the skin's oils and absorbs them without living behind a dry and dehydrated skin like a clay mask usually does. Mud is similar to clay as they both come from earth, but they are very different because the mud is water based and its also a great skin healing agent while clay is more harsh and drying. Mud is mineral rich, has regenerative properties and it has been harnessed for beauty treatments all over the world for centuries. 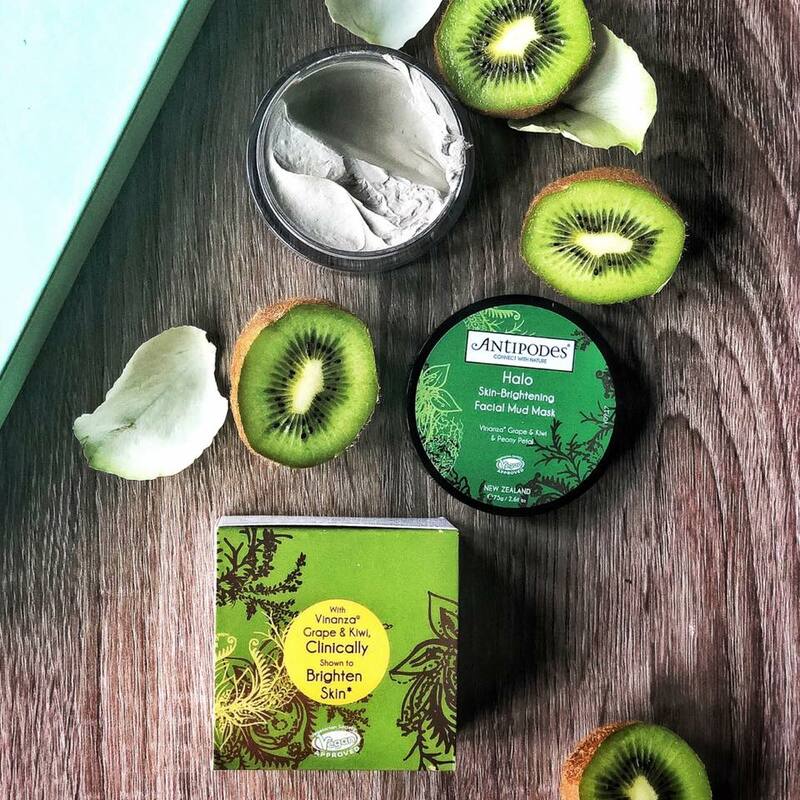 Antipodes is using kiwi seed oil in most of their skin care products and they used it also for this Holo mud mask, together with avocado oil, a revolutionary antioxidant called Vinanza Grape and extract of peony flower. The avocado oil used by Antipodes comes from organic orchards in an unpolluted area in New Zealand and it gives a super silky texture to the mud mask, making it a delight to use it as it feels very comfortable and nourishing on skin. The avocado oil is a natural humectant helping you skin to remain moist and hydrated while it also gives a vitamin boost - vit.A, B1, C, D and Omega 3 and 9. The revolutionary antioxidant compound Vinanza Grape & Kiwi has been clinically shown to lighten skin by targeting the over production of melanin that can lead to pigmentation and uneven skin tone. Extract of peony also contributes to a bright and luminous complexion. This Antipodes Holo Mud mask is divinely scented, with pure plant fragrance of vanilla pod, raspberry seed and musk. Definitely the best smelling mud ! I never been to New Zealand, but I really wish I could visit one day, until then I am going to try and discover the spirit of New Zealand nature with these amazing skincare products made by Antipodes. ********This is not a sponsored post. First time to hear about this facial mask brand and it looks really a good one to try. I will definitely check this out. They are a niche beauty brand and because they don't sell everywhere a lot of people never heard of them. For me was also the first time when I tried something from this brand,I love the fact that they use natural ingredients. It is good to read the review of other products and brands of skincare. And it sounds amazing. I love reading reviews before buying something,I do quite a research before I decide to buy something. A skin brightening mask sounds awesome. I would definitely want to try this. This is the first time I encounter this product and I am intrigue! Hope this is available in our nearest NZ store. I hope you find it in that store, but because they are making niche skincare they don't sell everywhere.You should probably check online, because I got mine online too. Looks like a nice box. I have never heard of this before but now I want to learn more about it. If you are interested in more information about this brand you can check their official site. Those look like some pretty great skin care products. I will have to share this with my daughter as I know she will be interested. That looks such an interesting beauty product. Love trying different brands.. Better try this one.. I have some face masks but never tried this one. I find your review helpful here and now i would like to try this one. I guess it will suit properly for my skin. I have a question please. Is this effective on under arm as well? If not, do you have some tips for brightening my under arms? Great review! I bought a lot of face masks but never has time to try it. I want this! Looks like an interesting mask! I love settling down in the bath and having a face mask on just to relax!